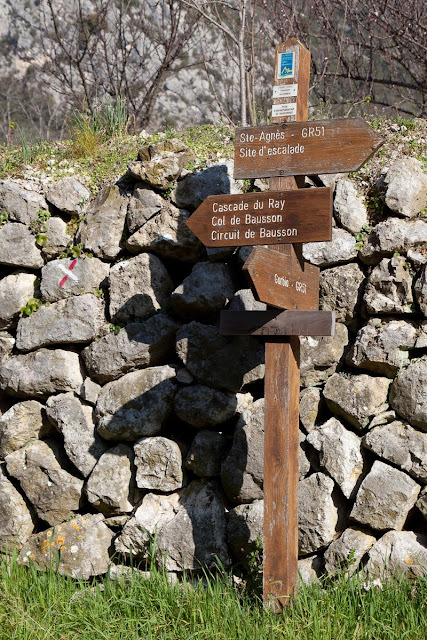 The hinterland of the Cote d'Azur is well-organised for ramblers by the Comité Départemental de la Randonnée Pédestre des Alpes Maritimes. Here's one of their many signs. We are turning left here, but soon we'll cut back towards the village. I'm not attempting any of the more difficult walks indicated on this sign. Not that I'm worried about myself, but I am worried if I fall and bash my camera. As it is, I had to cross a stream, which used to have really solid boulders as stepping stones - now some are washed away and those that remain are rather wobbly. In another area, there are rock falls that make life more difficult than it used to be. I had to clamber on all fours for part of that - glad no one was watching! Not everyone who visits the south of France comes for the beaches. Rambling is a big part of French life in the Alpes-Maritimes. Pour les randonneurs, l'arrière-pays de la Côte d'Azur est bien balisé par le Comité Départemental de la Randonnée Pédestre des Alpes Maritimes. Voici l'un de leurs nombreux panneaux. Ici, nous allons tourner à gauche, mais bientôt nous reviendrons vers le village. Je n'essayerai aucune de ces promenades les plus difficiles indiquées sur ce panneau. Non pas que je sois inquiète pour ​​moi-même, mais j'aurais peur de tomber et de casser mon appareil photo. Comme c'est le cas, je devrais traverser un ruisseau, qui ordinairement présente des rochers vraiment solides comme tremplins - maintenant certains ont été emportés et ceux qui restent sont plutôt bancals. Dans une autre partie, il y a des chutes de roches qui rendent la vie plus difficile que d'habitude. J'ai dû grimper à quatre pattes sur une partie de ce trajet -heureusement, personne ne me regardait! Tous ceux qui visitent le sud de la France ne viennent pas pour les plages. Les randonnées occupent une grande partie de la vie française dans les Alpes-Maritimes. I'd like to walk there, too! Nice meeting you here at Jilly's place. She posts wonderful photographs with a new Canon camera. oh, my, jilly. perhaps it's better we didn't take this walk. i'm not as worried about cameras as i am about fragile little bones. please be careful! Hello Abraham from Ohio, nice to meet you! Yes Jilly, take care of both: Bones + camera! I'm really pleased that you are taking us on this randonnee...another side of the South of France. I have done some of the GR in the Cevennes...just stunning! Lucky for us you are an intrepid rambler, Jilly. This walk is beautiful. That's my kind of holiday - I've got my hiking shoes on, ready to follow!